FACT and Liverpool Small Cinema both set to screen Jacques Tati classics. With FACT set to screen the Jacques Tati classic Playhouse and the Liverpool Small Cinema showing Mon Oncle, Getintothis’ Adam Scovell appraises the French comedic maestro’s highly ambitious and still relevant critiques of our obsession with technological gadgetry. By a sheer quirk of comedic fate, this month presents the chance to see two different films by the French comic master, Jacques Tati. The pair of films work brilliantly as a double-bill, not only because they were made one after the other, but because they both have much to say about modern society and its ridiculous whims. Tati, an actor, writer, producer and director, is France’s strongest comedic figure, being one of the few to match genuine hilarity with cinematic merit. It is a mixture that’s more often associated with silent-era comedy and the comedian is one of the few to manage to continue the tradition of artistic comedy (honed by the likes of Keaton, Chaplin and Lloyd) far after the silent era had ended. The two films in question are Mon Oncle (1958) and Playtime (1967). Both deal with similar ideas but on different visual levels. 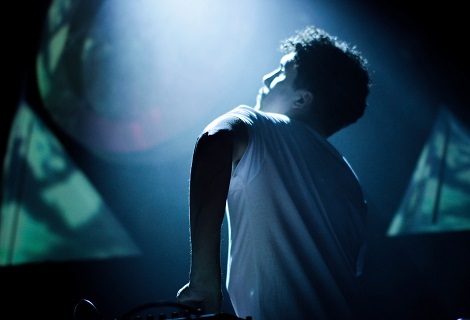 Tati has become known as the supreme orchestrator of chaos and his presence at an event, in a building or in a business of some form, has the power to literally cripple the smooth running of anything and anyone within the area. Monsieur Hulot, the character whom Tati plays in all of his films, is the epitome of an accidental anarchist as he stumbles about, often confused by modern life but also often leading to the very literal failing of such modernity, especially technologically. In Mon Oncle (My Uncle), he plays a childish uncle who visits his nephew and his family at their ultra-modern 1950s home. The house is one of automatic doors and instruments, of strange water fountains that seem to have a will of their own, and all of the latest domestic gadgets one could not need. Hulot on the other hand, lives in a ramshackle, cacophony of a building, clearly shown to be the more desirable of the two. His visit to the grey, metallic house leads to various breakages, building eventually to him digging up the garden in order to find out the problem with the water feature. Hulot is a character who can never just leave things alone. Tati is clear in his ambition to critique modern life and in particular our own (then gradually building) obsession with domestic technology and the idea of owning objects. In a way, he built many of his themes on Chaplin‘s dismay in Modern Times (1936) where the simpler ways of living had fallen by the wayside and had been replaced with utter mechanised totality. Like Chaplin, Hulot/Tati finds that the best way to fight against this force isn’t to do so aggressively but to simply see if it really does withstand actual use (if it has a use at all). Mon Oncle is built on the visually pleasing and often hilarious idea that these gadgets and objects really can’t. Almost a decade later, Tati would take these ideas and apply them on a far bigger scale to showcase the lunacy of the late 1960s high-rise culture. Along with Mon Oncle, Playtime often features in greatest film polls and, on a sheer visual level alone, it’s not difficult to see why. Mon Oncle also had scale, especially in Hulot‘s own building, but to take such a level of chaos and apply it successfully to huge inner-city buildings and places is a dramatic achievement. Hulot is exploring the modern high-rise buildings of Paris; all glass doors and metallic people. The film speaks of the strange disconnect rising up between people, in spite of opaque walls evaporating into translucent glass. 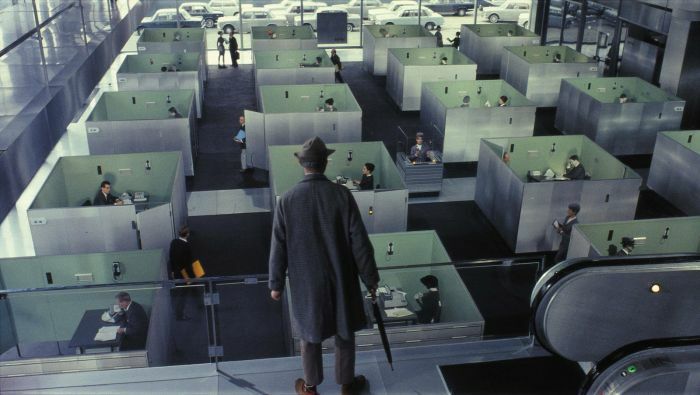 The chaos Hulot causes most of the time in this film is by actually reconnecting people while they are supposed to be busy at work; the playtime of the title is when people have to deal with each other again outside of the norms of modern work etiquette. This is never more brilliant than in a huge set-piece involving the opening of a new restaurant which somehow manages to succeed in spite of the building literally falling apart around the new customers thanks to Hulot and his inability to cope with its modern design. Though both films are French, subtitles are rarely needed, if at all. Tati is a such a visual filmmaker that both Mon Oncle and Playtime could easily work as silent films (though several of the visual punch lines do require diegetic sound) and it is a testament to his directorial skill that such a potential can exist. Vitally, these two Hulot films highlight the absurdity of want, especially a want linked with sociological influence and needless gadgetry. Had Tati seen how far the obsessions he found confusing then would go, who knows what total chaos he could have sprung on the unsuspecting technology of today, forever distancing in its application but never invincible to the physicality of real life. Mon Oncle screens at Liverpool Small Cinema on 11 June at 19:30. More Info here. Playtime screens at FACT on 14 June at 18:00. More info here.